Media captionLocal residents are "concerned about our and our children's health"
The Welsh Government told Caerphilly council their decision does not meet legal requirements and they should buy homes on Woodside Terrace in Crumlin to be within clean air guidelines quicker. Nitrogen dioxide levels on the street breach world health and EU rules. Environment minister Lesley Griffiths will write to Caerphilly council bosses "reminding them of the legal requirements" set by the High Court and said "cost cannot be a consideration". Homeowners wanted the council to use compulsory purchase powers to buy their terraced houses on the busy Hafodyrynys Road, which has an estimated 21,000 vehicle movements a day. The A472, between Newbridge and Pontypool, is the only road that links the Ebbw and Afon Lwyd valleys other than the M4 motorway 10 miles south or the Heads of the Valley road 10 miles north. Buying and demolishing the 23 houses and businesses, which would cost about £4.5m, would make Caerphilly council clean air compliant on Woodside Terrace by 2023. The Welsh Government contacted Caerphilly council before its cabinet meeting on Wednesday to say this was its preferred option because it would "achieve compliance in the shortest possible timeframe". But councillors voted for a "do minimum" approach even though it would take two years longer for the stretch of road to hit the World Health Organisation's (WHO) clean air target of 40 µg/m3 - 40 micrograms of annual nitrogen dioxide per cubic metre of air. The council said this was because it could only offer market value with compulsory purchase - and residents felt current valuation of their properties was significantly less than a fair price, mainly because of pollution. "We do not want to see any of the residents facing financial difficulties as a result of the compulsory purchase process," said council leader Dave Poole. 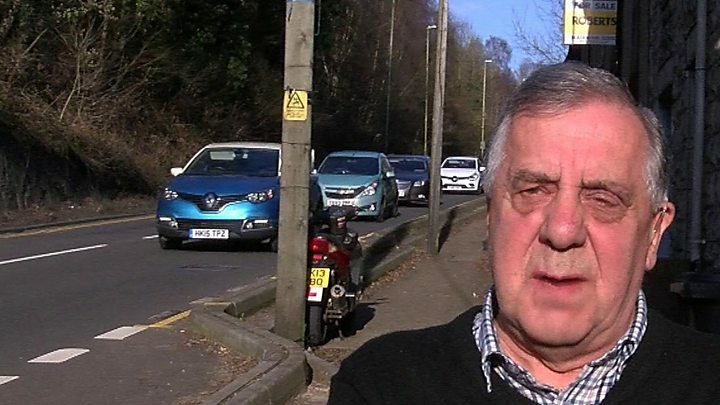 Image caption Andrew Hardwick said over the past few years traffic had got "worse and worse"
The council says clean air targets would be met by 2025 as newer vehicles were "predicted to deliver air quality improvements" if European engine standards delivered expected emissions cuts. The council has started a 10-week consultation and the government said it was "scrutinising" the authority's decision. Caerphilly said it would lobby government for additional funding to "ensure that affected residents are not pushed into financial hardship if we are forced to undertake compulsory purchase orders". The government has said they have "made it clear that funding is available to support the necessary actions to deliver compliance with air quality levels". The WHO said higher exposure to nitrogen dioxide was linked to "symptoms of bronchitis in asthmatic children" and reduced lung function growth.